Sediment basins are temporary practices commonly used to detain stormwater runoff and capture suspended sediment on construction sites. A 79.0 m3 (2790 ft3) sediment basin testing apparatus at the Auburn University—Erosion and Sediment Control Testing Facility was used to provide a series of controlled and repeatable, large-scale tests to understand the performance of sediment basins and provide improvements. This research evaluated five sediment basin configurations over the course of 27 individual tests, including: (1) a standard configuration, (2) the addition of an excavated sump upstream of a ditch check, (3) the modification of the first baffle, (4) a high-rate lamella settler in upward flow, and (5) a high-rate lamella settler in parallel flow. The primary metric for evaluating performance and the treatment effectiveness of a configuration’s ability in capturing sediment was assessed from turbidity measured across the basin surface. Multiple linear regression analysis indicated that an excavated sump provided insignificant improvement in sediment capture effectiveness. Furthermore, the modification to the first baffle was deemed ineffective in improving treatment efficiency. Lamella settler results indicated a 18.2% and 29.0% reduction in turbidity across the basin for upward and parallel flow configurations, respectively. This article is published as Perez, Michael A., Wesley C. Zech, Jose G. Vasconcelos, and Xing Fang. 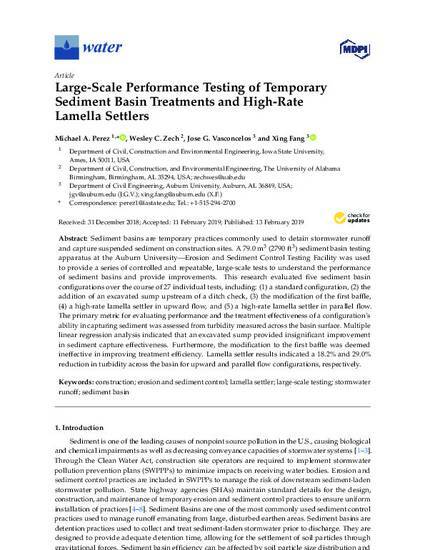 "Large-Scale Performance Testing of Temporary Sediment Basin Treatments and High-Rate Lamella Settlers." Water 11, no. 2 (2019): 316. DOI: 10.3390/w11020316. Posted with permission.